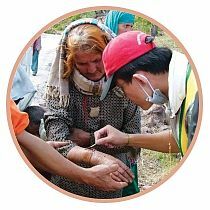 Right from the start, the Formosan relief team members perceived Master’s incredible blessing power at work as their visa applications were processed very smoothly. A secretary from the Pakistani embassy in Thailand not only issued the initiates landing visas but also provided vital information about time-saving flight schedules and emergency materials needed in the affected areas. The official made a special call to Pakistan International Airlines to facilitate reservations for the team, which promptly faxed the information back to Formosa so that the necessary medical equipment and medicines could be purchased quickly. 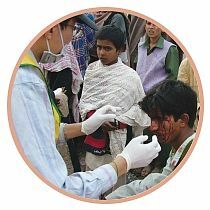 As a result, the volunteers arrived in the Pakistani capital of Islamabad a day earlier than expected, giving them extra time to study disaster-related data, purchase provisions and organize the relief operation. The team first went to the United Nations Temporary Information Center for Disaster Relief to gain information on the situation. There they learned that ninety-seven percent of roads to the affected areas had been cut off, and that they would need adequate food and warm clothing before venturing into the quake-stricken areas. The team members then decided to rent a vehicle and purchase the materials they needed. Next local police helped the initiates find a medium-sized van, which had originally been rented by a team of Korean relief workers who had no use for the vehicle since they were transported from the airport by Korean Embassy employees. The driver, Mr. Soghan, offered his services free of charge, and his van subsequently became the Formosa team’s exclusive vehicle during the relief operation. Next the manager of the local bus company found a kind gentleman, Mr. Ashraf Khah, to be the initiates’ guide, and also rented a smaller van for them at a discount rate. Thus, despite the difficulty of finding vehicles to rent in trying circumstances, Master made all the necessary arrangements. At sunset on October 12, the relief team arrived at the city of Abbottabad and checked into a hotel, where they learned more about the local situation from five physicians who had been traveling daily to and from the disaster-stricken areas. The initiates also contacted forestry bureau officials and learned that the government lacked the resources to reach remote mountain areas, where the weather was cold and quake victims urgently needed tents, blankets and food. When the roads to the area were restored, the team divided into two work groups and on the morning of October 14 the first went to Muzaffarabad, the capital of severely affected Azad (Pakistan-controlled) Kashmir to survey the situation and visit the local military hospital. The second group set up their satellite communications equipment and purchased a supply of daily necessities for the victims, including lentils, noodles, flour, rice, powdered milk, vegetable oil, biscuits, candy, blankets, women’s sanitary items and mineral water. Members of the first group then pitched their tents at a campsite outside the military hospital that was reserved for the United Nations relief team. Although no electricity, water or toilet facilities were available, the initiates used their wilderness survival skills to build a makeshift relief base out of canvas. On the afternoon of October 14, the second group delivered and began packing its emergency supplies at the military hospital campsite. During a meditation session that evening, the team members prayed to Master to convey Her love and blessings to the victims, expressing their wish to serve as vehicles in bringing hope to local residents so that they would quickly recover from the catastrophe. When Mr. Ashraf told them of heavy casualties in the area, the initiates moved quickly to conduct the rescue and relief work, with the second group rushing back to Abbottabad overnight to purchase a large quantity of supplies. With Mr. Soghan’s help, they managed to buy all the materials they needed at bargain prices from his cousin Mr. Sha. Also, although the initiates were complete strangers, Mr. Sha voluntarily approached his relatives and friends for help in finding vehicles and workers to assist in the relief effort. Thus, in less than a day, the group acquired more than forty tons of relief provisions, which were loaded onto six large trucks for delivery to the affected areas the next morning. Then on October 15, rescue helicopters began taking off and landing one after another in the rain, transporting the team’s medical supplies to mountain villages where access roads had been cut off. Another group of initiates went to the town of Mosalla to buy blankets, and on the morning of October 16 the first group loaded the materials onto a medium-sized van and proceeded to several mountain villages ten kilometers away. Upon entering the affected area, the sisters and brothers saw only collapsed houses and rubble, a truly traumatizing scene. Soon several injured victims came forward asking for help and the team’s physicians immediately treated their wounds and gave them medicine. Also, as the van traveled along the road, many victims came to get relief materials, which they held onto tightly while smiling and making thumbs-up gestures to express their gratitude. The relief packages also included photos of Master, and when the local children received the pictures they raised them up in delight. By the evening of October 16, the second relief team, along with Mr. Sha, his relatives and friends and fifteen local workers, delivered six truck-loads (forty tons) of aid supplies to the Relief Provisions Collection Center set up by the local government. Upon confirming the identity of the government relief officials, the team members stated that the provisions had to be delivered directly into the victims’ hands. 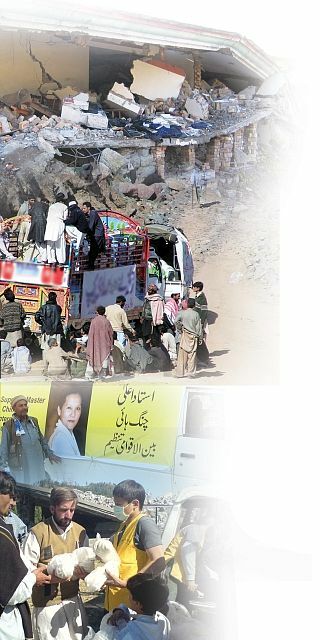 And the officials promised to bring the goods to those in the mountains who were most urgently in need of help. 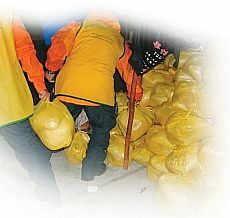 Then under police protection, the volunteers unloaded the materials, together with medical supplies, for the government relief authority. After the work was completed, the team members looked up and saw a bright full moon illuminating the night sky with a soft, warm radiance, and clearly felt that Master was right by their side taking care of everything! 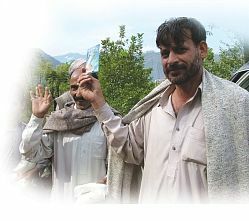 During their aid operation in Pakistan, the relief team could feel the kindness and benevolence of many local people such as Mr. Sha, who showed love for his compatriots by helping the initiates find vehicles and workers, and by insisting on paying for part of the transportation fees and drivers’ overtime wages. The driver Mr. Soghan and guide Mr. Ashraf also participated in the relief work till the end, and on the return trip Mr. Ashraf told the team, “After working with you for several days I can feel your sincerity and diligence. I can also tell that Supreme Master Ching Hai must be a great Master.” Then he left his contact information in hopes that the initiates would communicate with him later. 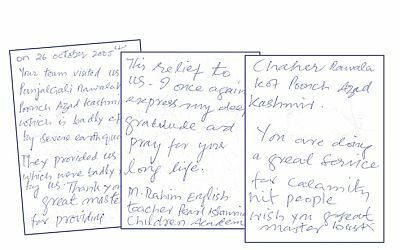 As the relief team was preparing to leave northern Pakistan on October 17, five local residents visited them wishing to learn more about Master and the Quan Yin Method. Among them was a middle-aged Muslim lady who was staying at an inn after her home had been destroyed in the quake. Observing the team members working hard to help her compatriots, she sensed the love coming from deep within their hearts and wished to know Master and join the Quan Yin group. So she gave the team her contact information, saying, “As a Muslim woman, I should not be contacting other people randomly or be photographed. But today my intense aspiration gave me the courage to come to see your group.” No doubt the woman’s soul had been touched by Master’s infinite love! Upon receiving news from the second relief team that the Pakistani and Kashmiri earthquake victims were in desperate need of tents as the cold of winter approached, Formosan initiates immediately set to work making purchases and packing the goods. And through Master’s love and blessings, the disciples soon received generous assistance in their relief efforts from Formosa’s Foreign Ministry and the Pakistani Embassy in Thailand. Both China Airlines and Pakistan International Airlines offered free transport of the relief supplies to the affected areas. The Formosan disciples purchased a total of 1,802 tents from two manufacturers, and one company’s employees even sacrificed their weekend to help pack the cargo. The initiates also prepared 700 scarves and 250 hats to help people rendered homeless by the quake to stay warm in their adverse environment. 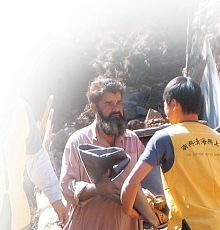 After the Formosan relief team went to Pakistan to conduct earthquake aid efforts, through Master’s blessing a group of Singapore initiates together with a German and UK initiate (a former Pakistani citizen), traveled to quake-stricken Azad (Pakistan-controlled) Kashmir to conduct relief work. On the night of October 15 the Singapore team arrived in the nearby non-affected city of Islamabad, and the next day a small group set off to assess the situation in Azad Kashmir and determine what relief items the victims needed. The team surveyed the northern part of the region and then moved on to affected areas in the south. There the initiates learned that the residents of Bagh and its environs were in need of shelters. And since the quake-damaged communities were scattered around a vast mountainous expanse, the team decided to provide the victims with canvas sheeting and ropes to make tents. However, around Bagh it was difficult to obtain tent and shelter sheeting because the demand had surged as other relief organizations and individuals bought up these items for their relatives and the additional affected families. 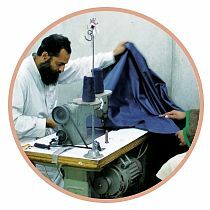 Nonetheless the team managed to purchase raw canvas and 170 shelter sheets and engaged two factories near Lahore to produce 7000 more 12’ x 10’ (3.7m x 3m) sheets with stitched edges and holders on the corners and sides for tying ropes. While the sheets were being sourced and manufactured, the initiates conducted more in-depth surveys of the affected communities, including those at high elevations, to plan for the distribution effort. Upon their completion, the sheets were transported to the team’s base camp in Bagh for distribution. Then, as the sheets were allocated, the local people expressed their deep appreciation to the initiates, especially since they had come from afar to help, and because of their diligence and attention to detail. Moreover, a local newspaper published a complimentary report on the relief team’s efforts. Your team visited us at Punjalgali Nawalakot Poonch, Azad Kashmir, which was affected by a severe earthquake on October 8, 2005. The team members provided us with tents, which we badly needed. Thank You, great Master, for providing this relief to us. You are doing a great service to calamity-stricken people. We wish you, great Master, the best. I once again express my deep gratitude and pray for Your long life.